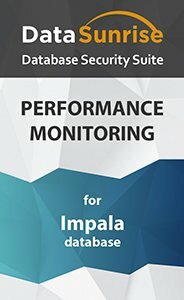 Impala Database Performance Monitoring from DataSunrise is a special tool that helps to identify and locate Impala databases performance problems. The Performance Monitoring tool gives a broad picture of all the events and processes happening in your Impala databases. You can get detailed information on BDMS processes, all executed types of queries and the frequency of execution. Impala Database Performance Monitoring is a valuable tool when searching for vulnerabilities deteriorating Impala databases performance. Query log that helps to detect redundant or unexpected queries. Time required to execute queries and track query change rate with time. Query types and their execution frequency. The number of operations per second. In addition to that Impala Database Performance Monitoring collects and logs audit information, detailed information of traffic from DB to Client, from Client to DB, keeps track of free space for your database(s) and memory usage. The information collected by Impala Database Performance Monitoring make the process of finding bottlenecks during database operation much easier. Using this tool you can analyze the performance of your database but in addition to that this information can be used at development and debugging stages. It guarantees that there will be no unexpected and unclear problems with your data storage system. DataSunrise with its integrated Impala DB performance monitoring and protection tools is an effective assessment solution for Impala as well as other databases that you may operate or want to start operating.